Home > Magazine Deals > Everyday with Rachael Ray Magazine: $4.99 per year! 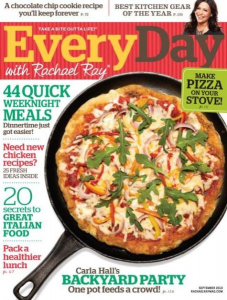 Everyday with Rachael Ray Magazine: $4.99 per year! Everyday withe Rachael Ray is a great magazine for all the busy chefs in your life. I fit the category of wanting to cook more, but not having the time or the energy when dinner rolls around. This has become one of my favorite magazines with tips and recipes that are fast but taste amazing. Whether you want to get a new subscription, renew an existing one or give this as a gift, today only get a great deal on a year subscription. You can subscribe to Every Day with Rachael Ray Magazine for only $4.99 per year (79% off)! Enter coupon code SOUTHERNSAVE at checkout to get the sale price. You can get up to a 4 year subscription at this price per year.